Brain natriuretic peptide (BNP) and N-terminal pro-BNP (NT-proBNP) are widely used at clinical sites in Japan for auxiliary diagnosis to support treatment for heart failure. However, as opportunities for measuring these values increase, medical professionals are also faced with more situations where they do not know how to interpret the blood levels measured or how to use these findings for heart failure treatment. Therefore, The Japanese Heart Failure Society has written this statement with the aim of appropriately evaluating BNP and NT-proBNP levels in heart failure treatment. When writing this statement, we also took into account references including various data from Japan, the Japanese Circulation Society Guidelines for Treatment of Chronic Heart Failure (2010 revised edition), the Guidelines for Treatment of Acute Heart Failure (2011 revised edition), and the European Society of Cardiology guidelines for the diagnosis and treatment of acute and chronic heart failure (2012 revised edition). 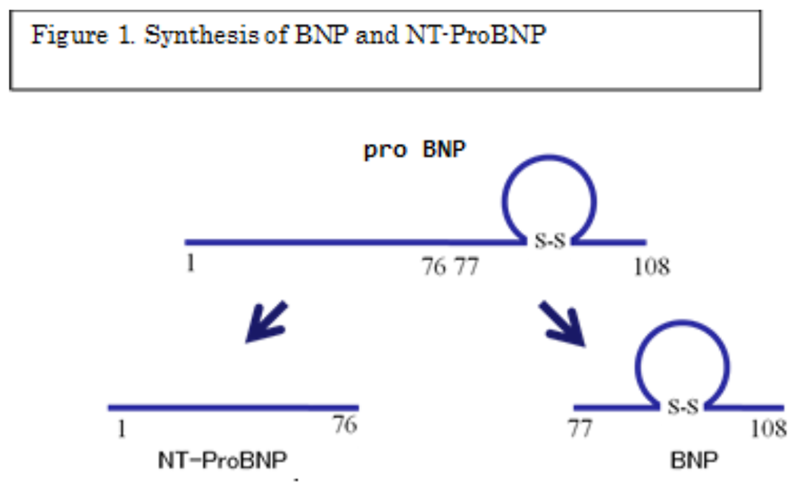 BNP and NT-proBNP are generated from the same BNP gene. After being transcribed and translated from the BNP gene, a BNP precursor (proBNP [1–108]) is generated and is then cut into the physiologically inactive NT-proBNP (76 amino acids from the N-terminal [1–76]) and the physiologically active mature BNP (the remaining 32 amino acids [77–108]). That is, BNP and NT-proBNP are secreted from the heart in equimolar amounts (Figure 1). Primarily in the ventricles, genetic expression is enhanced in accordance with wall stress (extension stress), which causes fast generation and secretion of BNP and NT-proBNP. Accordingly, as wall stress increases in heart failure, the blood levels of BNP and NT-proBNP also increase. Approximately 10% of both peptides are also secreted not only from the ventricles but also from the atrium. Therefore, their level slightly increases in atrial fibrillation. Factors other than stress to the heart can affect the blood levels of BNP and NT-proBNP, e.g., their blood level can increase with decreased kidney function. In particular, because the metabolism of NT-proBNP depends mainly on excretion by filtration from the kidneys, even a slightly decreased kidney function affects blood levels, and greater rises are seen in cases with estimated glomerular filtration rate < 30 mL/min/1.73 m2. In general, blood level of both peptides also rises in elderly individuals. Furthermore, high levels may be observed in acute inflammation. Conversely, lower levels of both peptides are observed in obese individuals compared with non-obese individuals. Therefore, the aforementioned factors must be considered when clinicians interpret the figures used in the present statement. BNP is measured in plasma, and NT-proBNP is measured in plasma or serum. The first step in using BNP and NT-proBNP levels in heart failure treatment is the early diagnosis of heart failure. Cutoff values are shown in Figure 2. Because BNP data are used more often in Japan than are NT-proBNP data, the figure focuses on BNP values. 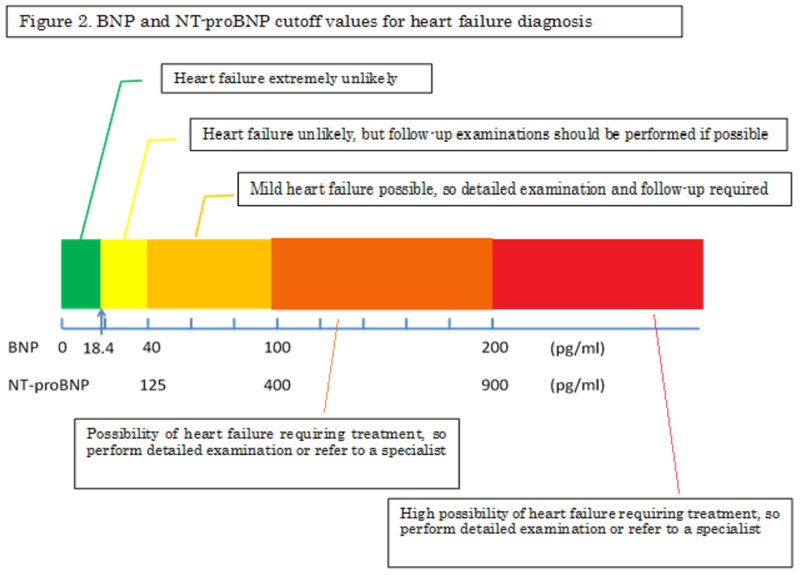 This figure illustrates cases in which BNP levels have been measured after the first suspicion of heart failure. A normal plasma BNP level of 18.4 pg/mL, which is commonly used, was adopted for this figure. When plasma BNP is lower than this level, latent heart failure is considered extremely unlikely. When the plasma BNP level is 18.4–40 pg/mL, heart failure requiring immediate treatment is considered unlikely, even in cases with risk factors for heart failure. However, the extent of heart failure may be underestimated if it is based on BNP levels alone in some cases (e.g., heart failure accompanied by conditions such as constrictive pericarditis, mitral stenosis, spasmodic arrhythmia, some ischemic heart diseases, and morbid obesity); therefore, the clinical evaluation should be determined based on symptoms and signs. When the BNP level is 40–100 pg/mL, mild heart failure may be present. Chest X-ray, electrocardiogram, and echocardiogram are recommended in cases that present with many risk factors or with the presence of underlying disease in which heart failure may occur. However, serious heart failure is unlikely when BNP is within this range, and a wait-and-see approach may also be taken if clinicians can identify the cause of the BNP rise. A BNP level of 100–200 pg/mL may indicate heart failure that requires treatment. Tests including echocardiography must be performed quickly, and the cause of the elevated BNP should be determined. If findings suggestive of heart failure are observed and treatment appears difficult, refer the patient to a specialist. BNP ≥ 200 pg/mL indicates a high likelihood of heart failure that requires treatment. Perform tests to determine the cause, and begin heart failure treatment if symptoms are present. If further treatment is necessary, consider referring the patient to a specialist. At present, no consensus has been reached regarding the NT-proBNP levels that correspond to the BNP levels just reported. Therefore, we propose that an NT-proBNP level of 125 pg/mL be considered equivalent to BNP 40 pg/mL, NT-proBNP 400 pg/mL be considered equivalent to BNP 100 pg/mL, and NT-proBNP 900 pg/mL be considered equivalent to BNP 200 pg/mL. We believe that treatment for cases that are definitively diagnosed with chronic heart failure can be conducted using BNP and NT-proBNP guidance. However, although it has been reported that BNP/NT-proBNP–guided treatment may lead to reduced hospitalization, no evidence has been reported demonstrating its effectiveness in decreasing mortality rates. This is an important point for future investigation. Fundamentally, there are no absolute values under which BNP and NT-proBNP levels must be maintained. In actual clinical settings, clinicians must establish optimal BNP and NT-proBNP levels for each individual patient and must conduct overall disease control, e.g., correction of lifestyle-related factors (quit smoking, quit drinking, decrease sodium intake, optimize diet, and increase exercise); moreover, physicians should initiate appropriate pharmacotherapy to maintain those levels. It is also important to compare presenting BNP and NT-proBNP levels during heart failure management with past values. A two-fold or greater increase than the previous value must have an underlying cause, which must be investigated, and appropriate intervention should be quickly undertaken. If possible, medication should be adjusted and heart failure control should be enhanced. BNP and NT-proBNP levels are prominent heart failure biomarkers. Although they are useful in heart failure treatment, these values alone cannot identify the primary or underlying disease. In other words, heart failure diagnosis and disease management based on BNP and NT-proBNP alone are impossible. Clinicians should question patients carefully regarding symptoms, thoroughly examine any signs, and make an overall judgment while taking other tests into account. We hope that the skillful use of BNP levels will lead to better heart failure treatment throughout Japan.